OK, so Dave really hasn’t been so cool since you were in College (or better yet, since I was in College), but there are few acts that can sell out a stadium like the DMB. In fact, according to Pollstar, with concert grosses totalling nearly $530 million from 2000 to 2009, the Dave Matthews Band was the highest-grossing North American touring act for the decade. With those kind of numbers, it may come as no surprise that Dave is “going big” on his next visit to NYC, with a two night stand at the still brand spanking new Citi Field on July 16-17, 2010. 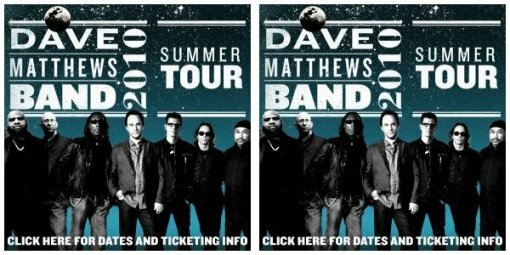 Tickets for Dave Matthews Band at Citi Field go on sale to the public on Feb 26, 2010 at 10AM EST (no word yet on presales). In other DMB news, rumors are spreading that Dave may be headlining Bonnaroo this year as there is a significant gap in his summer tour schedule from June 10-13, right around the time of the annual Tennessee music festival.